Much has been made of Hillary Rodham Clinton’s High School Yearbook picture. My Lamppost has a picture of Hillary that is young also but a little bit older than her high school days. 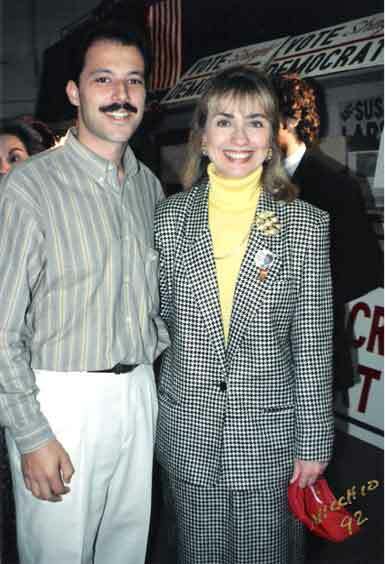 Enclosed is the My Lamppost Editor in much younger days posing with Hillary Clinton in Fall, 1992, in El Paso, Texas. Ms. Clinton was campaigning for her husband in those days. Her husband, Bill Clinton, won the United States Presidential General Election in November, 1992 when he beat incumbent President George H.W. Bush*. He became the 42nd President of the United States on Wednesday, January 21, 1993 and went on to serve 8 years as President, 1993 – 2001. * In 1992, Clinton, a Democrat from Arkansas, ran for President against the 41st President of the United States, George H.W. Bush, a Republican from Texas. There was a 3rd candidate for President and his name was Ross Perot, Independent from Texas. Did Perot prove instrumental in helping Clinton gain the White House or in helping Bush lose the White House? Consider this: Clinton handily won the 1992 Electoral Vote over Bush and Perot by a score of 370 -168 -0, respectively. However, the Popular Vote was closer. Clinton beat Bush 44.9 million votes to 39.1 million votes, a difference of only 5.8 million votes. Perot garnered 19.7 million popular votes on his own. Interesting, isn’t it?